In the 1930s Heath Robinson was known as "The Gadget King" and he is still most widely remembered for his wonderful humorous drawings. But humorous art was only his third choice of career, and one that he turned to almost by accident. On leaving the Royal Academy Schools in 1895 his ambition was to become a landscape painter. He soon realised that such painting would not pay the bills, so he followed his two older brothers into book illustration. He rapidly established himself as a talented and original practitioner in his chosen field, and in 1903 felt sufficiently secure to marry. However, the following year a publisher who had commissioned a large quantity of drawings was declared bankrupt. 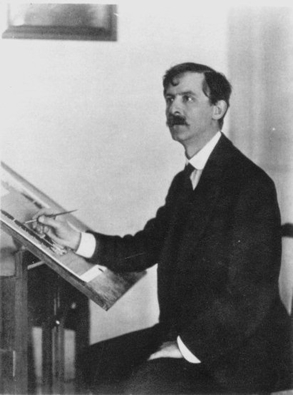 The young Heath Robinson, who had just become the father of a baby girl, had quickly to find a new source of income. He turned to the high class weekly magazines such as The Sketch and The Tatler who paid well for large, highly finished humorous drawings, and within a year was being acclaimed as a unique talent in the field of humorous art. For a number of years, he combined his careers as illustrator and humorist with equal and growing success, but by the end of World War One the market for lavishly illustrated gift books, which had flourished during the first decade of the century, had all but disappeared. The resulting gap was readily filled since his talents as a humorist were in ever increasing demand, especially for advertising. For the remainder of his career his main employment was in providing his unique brand of humour to magazines and advertising, supplemented by occasional commissions for fantasy illustrations. For his own pleasure, he continued to paint in watercolours, experimenting with effects of light and colour. His importance, as an innovator in the fields of illustration and advertising, and perhaps more importantly as the heir of Rowlandson and Cruikshank in the British humorous tradition, has yet to be fully appreciated, and his work is poorly represented in public collections.